This week we had a second Listener puzzle from Tangram, with the first being just over a year ago. That featured Shelley’s Ode to the West Wind: “O, Wind, If Winter comes, can Spring be far behind?” Looking out of the window, all I can say about this spring is that it’s wet and windy, so ideal crosswording weather! A straightforward Letters Latent puzzle here, with subsidiary idications leading to the entered answers. I hoped that his would be fairly straightforward, and I was off to a reasonable start with 16ac STEERABLE entered as STRABL, 19ac LIMACEL entered as LIACEL and 27ac NEEDS, NEES. 33ac Poet’s apparently removing from funeral stand as urn nigh prepared was an obvious anagram, and I guessed that a 10- or more letterd word would have at least one E, and it probably ended with –ING. I got UNH[E]ARSING fairly quickly after that. The down clues were helped by 6dn Ruined Ionian city, having buried year sign which was an anagram of Ionian city without the Y for year. ATION was almost staring me in the face, and IN[D]ICATION was slotted into the grid. Which poem, aged IOO featured a moonlit door? With a little licence, the IOO becomes 100. I confess that I needed Google to remind me about the moonlit door, but Walter de la Mare’s “Is there anybody there said the traveller”, the opening line from The Listeners, immediately brought back memories of my childhood … although exactly when it was, I’m not sure. Then, as now, it sent a tingle down my spine as I read it. 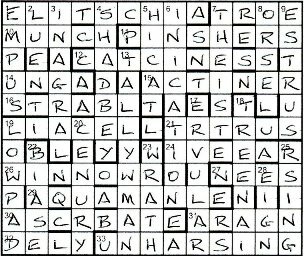 All that remained was to find THE LISTENERS in the grid, and there they were, minus the L in column 10. 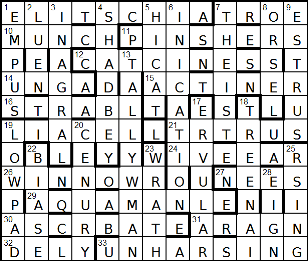 Thus the letter making it “homologous with the title” was the L, and it could also be fitted in the title of our puzzle to give Cluemasters, perhaps a reference to Listener setters. So thanks to Tangram for a very enjoyable puzzle and some good memories, and not too taxing after last week’s tussle with Elgin. This entry was posted on 11 May 2012 at 3:00 pm	and is filed under Solving Blogs. You can follow any responses to this entry through the RSS 2.0 feed. You can leave a response, or trackback from your own site.